Potent and selective ALK2 and ALK3 inhibitor (IC50 values are 5 and 30 nM, respectively); inhibits BMP4-mediated Smad1/5/8 activation. 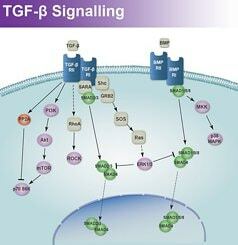 Exhibits >200-fold selectivity for BMP signaling over TGF-β signaling. Also exhibits selectivity over AMPK, PDGFR and MAPK signaling. Promotes neural induction of hPSCs in combination with SB 431542 (Cat.No. 1614). Also induces differentiation of hPSCs into nociceptive sensory neurons in combination with SB 431542 (Cat.No. 1614), SU 5402 (Cat.No.3300), CHIR 99021 (Cat.No. 4423) and DAPT (Cat.No. 2634). 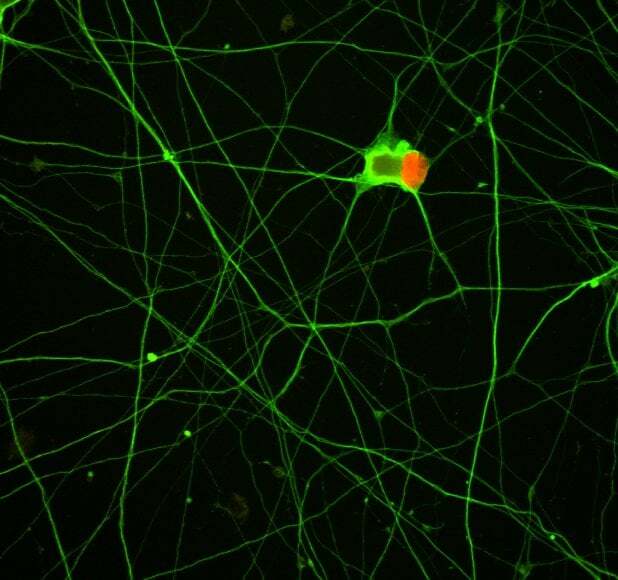 Image shows IBJ6 human fibroblast induced pluripotent stem cells which have been differentiated into motor neurons. This was performed using a combination of LDN 193189 (100 nM) and SB 431542 (Cat. No. 1614) followed by Retinoic acid (Cat. No. 0695) and Purmorphamine (Cat. No. 4551) culture on Laminin for 18 days. Commitment to the motor neuron fate was accessed using the motor neuron marker anti-Human Islet-1 (red, R&D Systems®, Cat. No. AF1837) and the general neuronal marker, beta III tubulin (green, R&D Systems®, Cat. No. MAB1195). For visualization, the neurons were stained using Northernlights™ 557-conjugated Donkey anti-Goat Secondary Antibody (R&D Systems®, Cat. No. NL001) and Northernlights™ 493-conjugated Donkey anti-Mouse Secondary Antibody (R&D Systems®, Cat. No. NL009). The following data is based on the product molecular weight 479.4. Batch specific molecular weights may vary from batch to batch due to the degree of hydration, which will affect the solvent volumes required to prepare stock solutions. 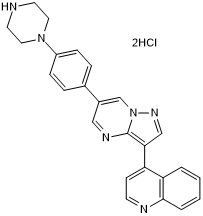 If you know of a relevant reference for LDN 193189 dihydrochloride, please let us know. Do you know of a great paper that uses LDN 193189 dihydrochloride from Tocris? Please let us know. There are currently no reviews for this product. 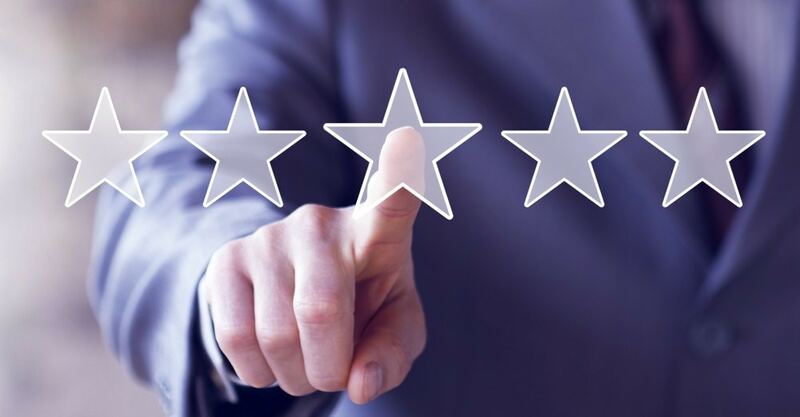 Be the first to review LDN 193189 dihydrochloride and earn rewards! Have you used LDN 193189 dihydrochloride? The following protocol features additional information for the use of LDN 193189 dihydrochloride (Cat. No. 6053).